With the same price, you can also get a stand with our scanner! Anti-Shock Soft Silicone:the orange silicone protective cover provides safe falling height from 6.56 feet with IP54 sturdy design. 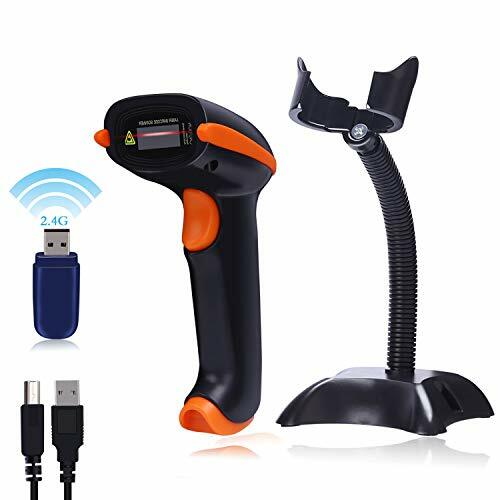 1300mah Long Life:built-in 1300mah rechargeable battery, the wireless barcode scanner has 12,000 hours of scan life, it can work about two weeks or 40000 times after 3 to 4 hours for the full charge of the scanner. Key Trigger Mode:red high speed laser reader when press the trigger provides fast accurate reading speed. Continuous Scan Mode:set up continuous scan mode switch to automatic mode for quick scanning without pressing any buttons with scanner stand included which provide hands-free. Storage Mode:when using the scanner far away the wireless signal range, activate storage mode, all scanned barcode will be stored directly into the built-in memory of the scanner. 25 Kinds of Language:Provide 25 kinds of languages (Please contact our customer service if you need German, French, Spanish, Italian, Japanese instructions which we can provide PDF manual for you). Exquisite Package Box:our unique product packaging box is designed by a professional design team, and the brand of Tera barcode scanner was designated procurement many times by the German State Government. Can't read any barcode from Screen. Fast Accurate Reading Speed: 32Bit CPU super decoding ability that the speed can up to 300/sec, instant upload mode/storage mode which the internal offline storage supports up to 100,000 barcodes in storage mode.Fast Accurate Reading Speed: 32Bit CPU super decoding ability that the speed can up to 300/sec, instant upload mode/storage mode which the internal offline storage supports up to 100,000 barcodes in storage mode. Anti-Shock Silicone: the orange silicone protective cover can avoid the scratches and friction while falling from the height of 6.56 feet; the technical of IP54 sturdy which protect the wireless barcode scanner from dust and moisture.Anti-Shock Silicone: the orange silicone protective cover can avoid the scratches and friction while falling from the height of 6.56ft; the technical of IP54 sturdy which protect the wireless barcode scaffline storage supports up to 100,000 barcodes in storage mode. If you have any questions about this product by Tera, contact us by completing and submitting the form below. If you are looking for a specif part number, please include it with your message.